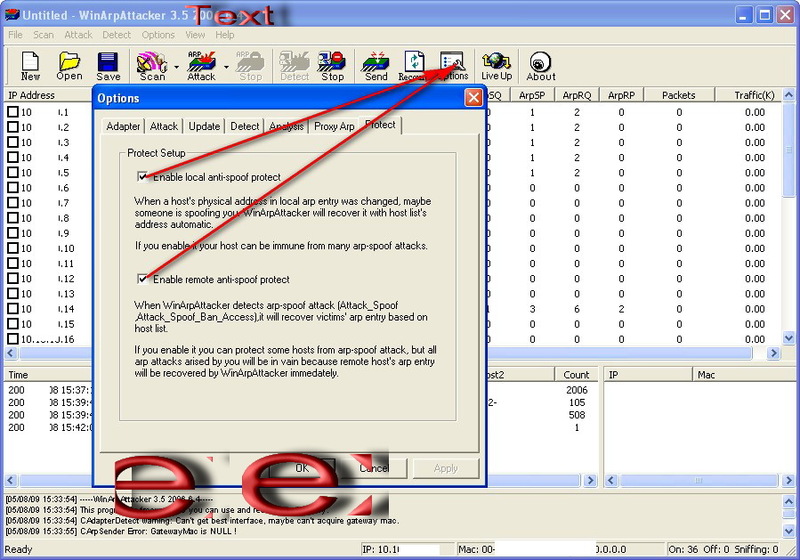 WinArpAttacker is a program that can scan,attack,detect and protect computers on local area network. -. It can scan and show the active hosts on the LAN within a very short time (~2-3 seconds). It has two scan mode, one is normal scanning, the other is antisniff scanning. The later is to find who is sniffing on the lan. -. It can save and load computer list file. -. It can scan the Lan regularly for new computer list. -. It can update the computer list in passive mode using sniffing technology, that is, it can update the computer list from the sender's address of arp request packets without scanning the lan. -. It can perform advanced scanning when you open advanced scanning dialg on menu. -. It can scan a B class ip range in advanced scan dialg. -. It can scan acthost listed in event listview. -. It can pull and collect all the packets on the LAN. (2) BanGateway - Tell the gateway a wrong mac address of target computers, so the targets can't receive packet from the internet. This attack is to forbid the targets access the internet. (3) IPConflict - Like Arp Flood, send ip conflict packets to target computers regularly, maybe the users can't work because of regular ip conflict message. what's more, the targets can't access the lan. (4) SniffGateway - Spoof the targets and the gateway, you can use sniffer to collect packets between them. -. While spoofing ARP tables, it can act as another gateway (or ip-forwarder) without other users' recognition on the LAN. -. 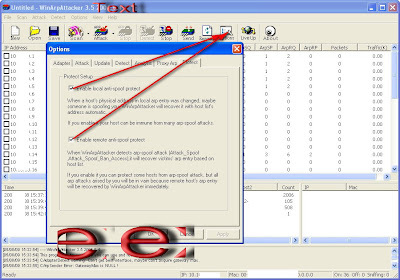 It can collect and forward packets through WinArpAttacker's ipforward function, you had best check disable system ipforward function because WinArpAttacker can do well. -. All data sniffed by spoofing and forwarded by WinArpAttacker ipforward function will be counted, as you can see on main interface. -. As your wish, the arp table is recovered automatically in a little time (about 5 seconds). Your also can select not to recover. SrcMac_Mismath - Host sent an arp packet, its src_mac doesn't match,so the packet will be ignored. DstMac_Mismath - Host recv an arp packet, its dst_mac doesn't match,so the packet will be ignored. Arp_Scan - Host is scanning the lan by arp request for a hosts list. Arp_Antisniff_Scan - Host is scanning the lan for sniffing host,thus the scanner can know who is sniffing. Host_Online - Host is online now. Host_Modify_IP - Host modified its ip to or added a new IP. Host_Modify_MAC - Host modified its mac address. New_Host - New gost was found. Host_Add_IP - Host added a new ip address. Multi_IP_Host - Host has multi-ip addresses. Multi_Mac_Host - Host has multi-mac addresses. Attack_Flood - Host sends a lot of arp packets to another host ,so the target computer maybe slow down. Attack_Spoof - Host sends special arp packets to sniff the data two targets , so the victims' data exposed. Attack_Spoof_Lan - Host lets all host on the lan believe that it's just a gateway, so the intruder can sniff all hosts' data to the real gateway. Attack_Spoof_Ban_Access - Host told host that host has a inexist mac,so the targets can't communicate with each other. Attack_Spoof_Ban_Access_GW - Host told host that the gateway has a inexist mac, so the target can't access the internet through the gateway. Attack_Spoof_Ban_Access_Lan - Host broadcast host's mac as a inexist mac, so the target can't communicate with all hosts on the lan. Attack_IP_Conflict - Host found another host has same ip as its, so the target would be disturbed by ip conflict messages. Local_Arp_Entry_Change - now WinArpAttacker can watch local arp entry, when a host's mac address in local arp table is changed, WinArpAttacker can report. Local_Arp_Entry_Add - When a mac address of a host is added to local arp table, WinArpAttacker can report. -. It can explain each event which WinArpAttacker detected. -. It can save events to file.